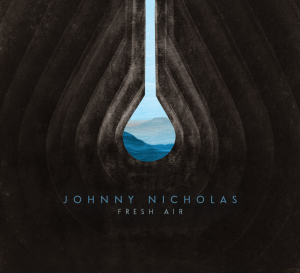 Fresh Air by Johnny Nicholas is one of the most diverse blues albums of the year. With thirteen tracks, there is something for everyone here. Each track has been uniquely crafted, offering a different sound and story for the well-tuned ear. Nicholas wastes no time in rockin’ it with “Moonlight Train.” His harp skills are a perfect match to his vocals, and pair nicely with Scrappy Jud Newcomb’s mesmerizing yet haunting guitar skills. Together, they add an old school blues flavor to the song. If listeners gravitate towards the Chicago sound, then they will be drawn to “Backdoor Man.” Written by Willie Dixon in 1960 and recorded by Howlin’ Wolf, it would serve as the B-side to Wolf’s “Wang Dang Doodle.” Covered by The Doors on their debut album in 1967, this is a favorite of blues fans the world over. Scrappy Jud Newcomb trades in his guitar for a mandolin on “Kid Man Blues,” clearly the perkiest tune on the album. No folks, the ears are not playing any tricks on us. That slide guitar playing we hear is none other than the talented Cindy Cashdollar! With its upbeat tempo, “Kid Man Blues” should be the anthem for summers going forward. “Roll On Mississippi” is a painting within a song. From beginning to end, listeners are treated to a musical image of our twentieth state. The song has a softness to it courtesy of the blending of mandolin and acoustic guitar, creating a soothing atmosphere. If a funky old blues organ with a driving bass line and a slow slide guitar are what folks crave, “Blues Time” is the song to check out! A perfect way to chill out after a long day at work, folks instantly feel the stress of the day melt away when they turn this one up. Fresh Air is a gathering together of some of the finest musicians in the business, delivering thirteen rockin’ new tunes. With the smooth style of Cashdollar’s slide guitar and Newcomb’s mandolin, fans will love this new music from Nicholas. This is Nicholas’ finest release yet, with several songs sure to be requested at future shows.